What you guys do when you’re cleaning the house? I listen to Lady Gaga (ow!) and dance around while Elliot raises his eyebrows at me. What do you guys do when you see a mini popsicle mold in the Target dollar section? I grab one and look around to see if everyone else is as excited as I am. They aren’t. What do you do when you have seven awesomely cute mini fudgesicles? I try to justify them all in one sitting, but don’t because I can’t wear stretchy pants to work for the rest of my life, and I guess I should give Jake one. P.S. These are basically frozen ganache. Oh my ganache; they’re good. Place chopped chocolate in a heatproof bowl; set aside. Combine heavy cream, milk, and cocoa powder in a medium saucepan over medium heat. Whisk until cocoa is dissolved and the mixture comes to a simmer. Remove from heat and pour over chocolate. Let it stand for 2-3 minutes. Whisk until smooth, stirring in vanilla. Pour through a fine-mesh strainer in case the cocoa powder was clumpy. Divide mixture evenly among the molds and place in the freezer. Freeze for at least 4 hours or until solid. 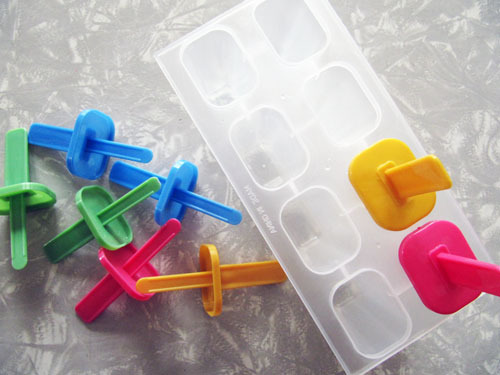 TIP: Run the molds under warm water to loosen up the popsicles. If you accidentally pull the stick out simply run water over the stick; re-insert and re-freeze! 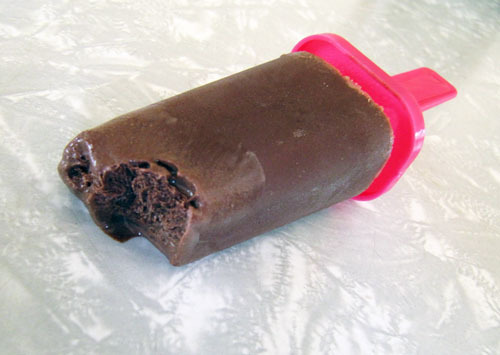 This fudgesicle wasn’t born this way. oh my ganache! i love that! these have got to be far better than their store bought counterparts. !! My neighbor ate one and compared it to cake. ha! Decadence at it’s best (with cute popsicle molds to boot)!! Thanks Zoe! 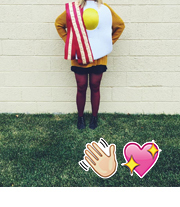 You’re a peach. I dance when I do housework too. Dance parties make it more fun. I just got a popsicle mold set. I need to try these out! Yum, and perfect for hot weather we’ve been having here! 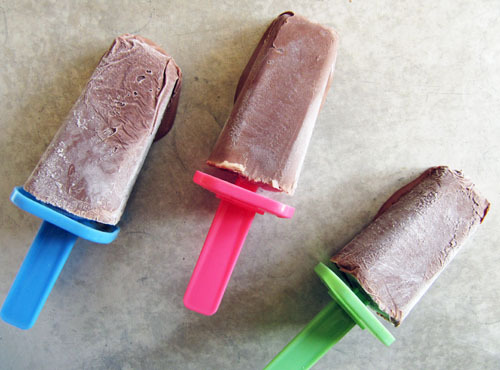 I got an el cheapo popsicle maker a while back and loved experimenting with it, too. 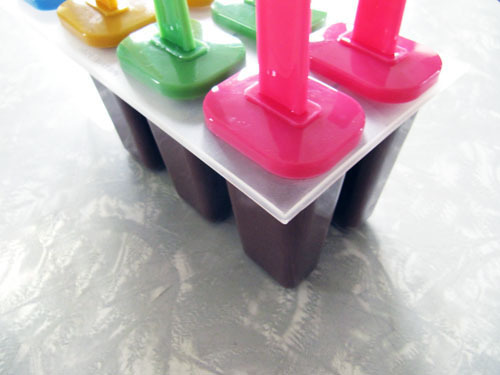 Now I want a Zoku Quick Pop maker SO bad. We need them, Megan! We really do! I want the quickest of pops! man, if i saw mini pop molds at target, i would’ve squealed audibly. do want! 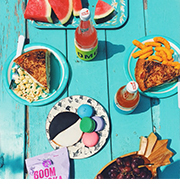 i’m going to keep my eyes peeled in that dollar section next time; these look deeelicious. Candice! You totally get me! ooh yeah man! you need some pops in yo life! We’re having a major heat wave in my town so this post is beyond amazing to me. I need to buy pop molds asap. Why don’t I have them already?? I know what you mean! It’s too hot to handle here in the mitten too! Basically I wish they wish they made stretchy pants for men that were allowable in public. Also it’s okay, I got just as excited as you did when I saw popscicle molds in Target’s dollar section. Also I’m going to pull your coffee smore’s ganache here and infuse them with coffee. watch out. I love everything about this! And hell to the yeah about making these coffee-tastic. I like the way you think!